Malachi is a pup out of our Tyler, bred by our Freedom. I did not think Tyler had bred but she surprised me with one single pup... but what a pup! 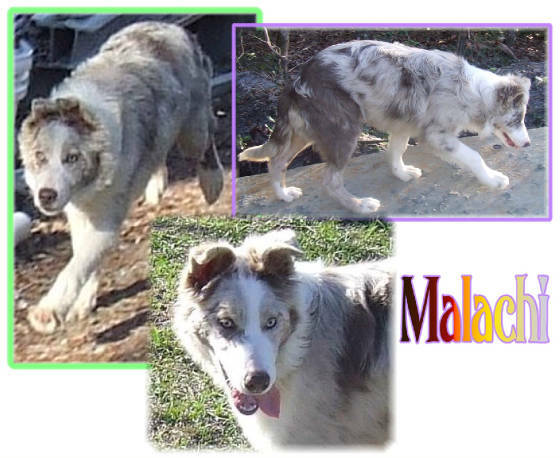 Malachi is a lilac merle tri with two icy grey eyes. 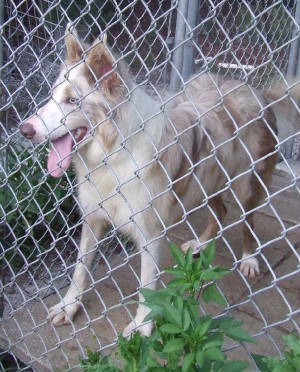 He is a dilute and has very nice markings. Basically, the only way to know he is a tricolor is under his tail! 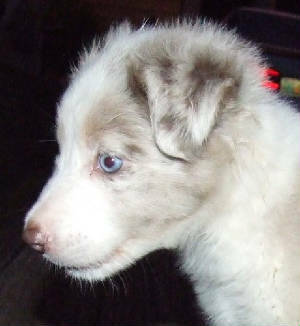 He has a gorgeous double coat and a great temperament so far. 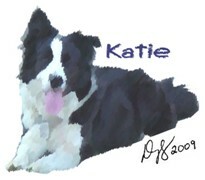 I am hoping to incorporate him into our breeding program when his father retires. 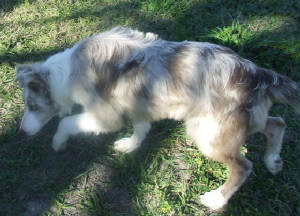 Keep watching for updated photos and check out his awesome pedigree! 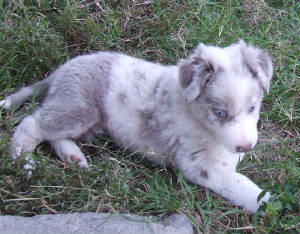 His favorite things to do are play tug-of-war and running as fast as he can! This guy has a lot of energy! 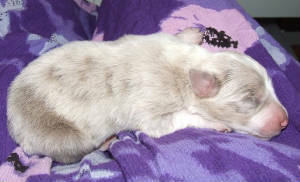 Malachi at 5 days old. Malachi 5.5 wks. 1st time outside. 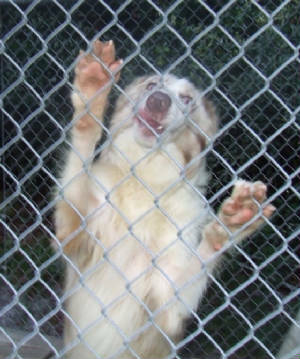 Ringtail puppy. Malachi 5.5 weeks old. Outside for first time. 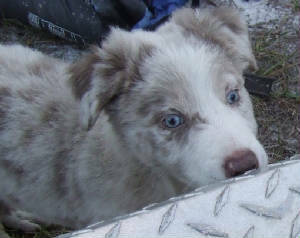 Malachi at 6 weeks old. 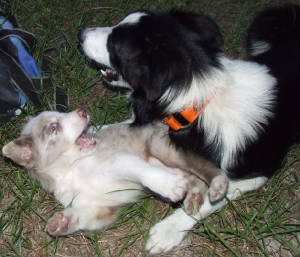 Malachi at 6 weeks playing outside with Monk. 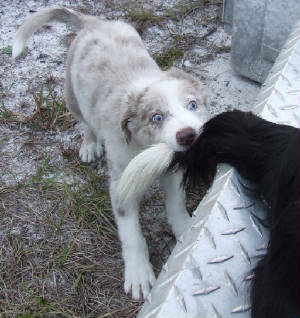 Malachi at 8 weeks old, pulling Monk's tail. 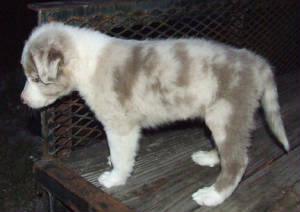 Malachi "Shorts" at 8 weeks old...little fur ball! 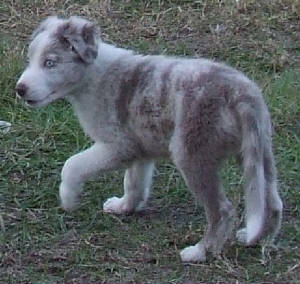 Malachi, 8 weeks. "Hey, am I missing anything?" 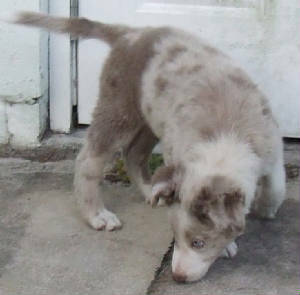 Malachi 8 wks, has coat like a lamb! Very Fuzzy! Malachi at 4 months old. Gorgeous coat! Malachi at 4 months old. 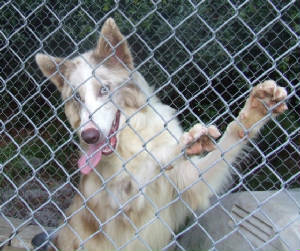 6/10 Malachi in his kennel at dinner time. He very often looks like he's part WOLF! He's wildly beautiful! He's gorgeous inside and out! He doesn't have a mean bone in his body though. This page updated last on 9-19-10.